Her large size is no comparison to her big heart, and she’ll show you her love as well as any lapdog! We know that because you care so much about your dog, you want to take good care of him. That is why we have summarized the health concerns we will be discussing with you over the life of your Large Mixed-Breed. 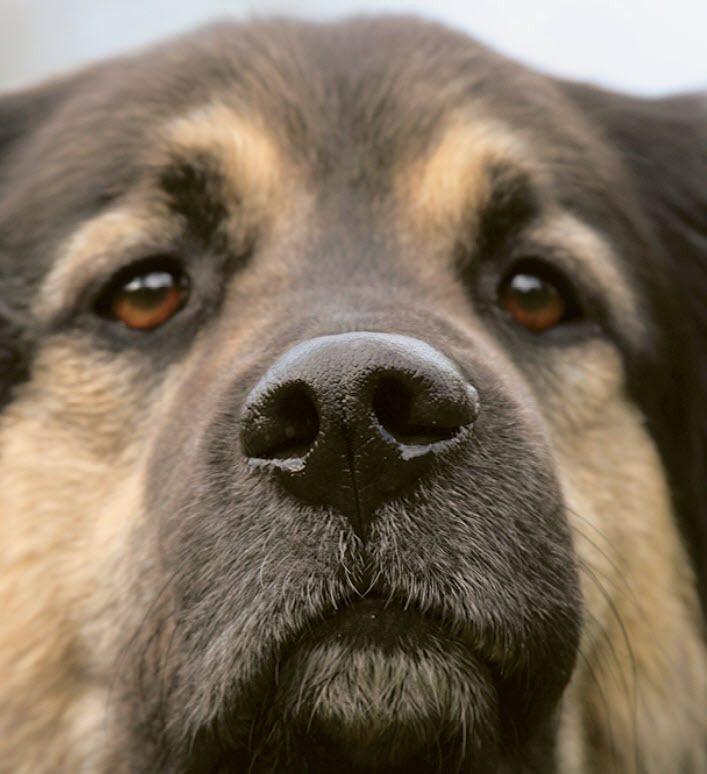 By knowing about health concerns specific to large dogs, we can tailor a preventive health plan to watch for and hopefully prevent some predictable risks. Dogs are one of the earliest species of domesticated animals, possibly even the first! Kept as companions for protection, hunting, and sociability, the ancestors of modern-day dogs helped establish themselves in the long term as man's true best friend. Believe it or not, every breed of dog today is derived from one early species of wolf! Yes, even Chihuahuas and Great Danes came from the same wolf ancestor! Over the thousands of years that dogs have lived with humans, they have been selectively bred for many different traits, such as size, intelligence, athleticism, and even just cuteness, eventually establishing all the breeds we know and love today. The downside to selective breeding can be a genetic predisposition to certain syndromes, illness, or injuries and your Mixed Breed is at risk for inherited conditions passed down from the dam and sire. Whether your pup is purebred or mixed, he's 100% dog at heart, and considering the history of the species, that's saying a lot! This guide contains general health information important to all canines as well as the most important genetic predispositions for Large Breeds. This information helps you and us together plan for your pet’s unique medical needs. At the end of the article, we have also included a description of what you can do at home to keep your pet looking and feeling his best. You will know what to watch for, and we will all feel better knowing that we’re taking the best possible care of your pal. Large Breeds are susceptible to bacterial and viral infections — the same ones that all dogs can get — such as parvo, rabies, and distemper. Many of these infections are preventable through vaccination, which we will recommend based on her age, the diseases we see in our area, and other factors. Obesity can be a significant health problem in Large Breed dogs. It is a serious disease that may cause or worsen joint problems, metabolic and digestive disorders, back pain, and heart disease. Though it’s tempting to give your pal food when she looks at you with those soulful eyes, you can “love her to death” with leftover people food and doggie treats. Instead, give her a hug, brush her fur or teeth, play a game with her, or perhaps take her for a walk. She’ll feel better, and so will you! One of the best things you can do for your Large Breed is to have her spayed (neutered for males). In females, this means we surgically remove the ovaries and usually the uterus, and in males, it means we surgically remove the testicles. Spaying or neutering decreases the likelihood of certain types of cancers and eliminates the possibility of your pet becoming pregnant or fathering unwanted puppies. Performing this surgery also gives us a chance, while your pet is under anesthesia, to identify and address some of the diseases your dog is likely to develop. For example, if your pet needs hip X-rays or a puppy tooth extracted, this would be a good time—it’s more convenient for you and easier on your friend too. Routine blood testing prior to surgery also helps us to identify and take precautions against common problems that increase anesthetic or surgical risk. Don’t worry; we’ll discuss the specific problems we will be looking for when the time arrives. 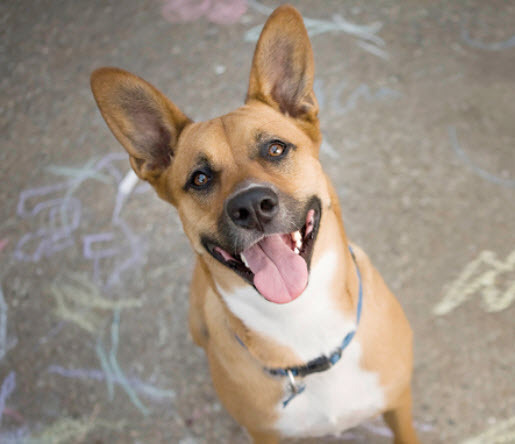 You may want to pursue genetic testing for your mixed-breed dog because identifying your pal’s genetic make-up is an important step you can take to ensure his future health and happiness. Just because your pet might look like a Collie doesn’t necessarily mean his genes are a Collie’s! And even if your pet is part pure bred, it doesn’t mean he’ll have the same behavioral tendencies or health risks as that breed. He may have inherited traits and predispositions from his parents or even grandparents of entirely different breeds! We want to know which breeds are included in your dog’s genetic make-up so we can help you know what to expect in terms of his behavior and health. Gastric dilatation volvulus, also known as GDV or bloat, usually occurs in dogs with deep, narrow chests. This means your Large Breed may be at increased risk. When a dog bloats, the stomach twists on itself and fills with gas. The twisting cuts off the blood supply to the stomach and sometimes to the spleen. Left untreated, the disease is quickly fatal, sometimes in as little as half an hour. Your dog may retch or heave (but little or nothing comes up), act restless, have an enlarged abdomen, or lie in a prayer position (front feet down, rear end up). Preventive surgery in which the stomach is tacked down or sutured in place so that it is unlikely to twist is an option. If you see symptoms, take your pet to an emergency hospital immediately! Cancer is a leading cause of death among dogs in their golden years. Your Large Mixed-Breed, however, may be more prone to certain kinds of cancer that can appear at a younger age. Many cancers are cured by surgical removal, and some types are treatable with chemotherapy, but for all types, early detection is critical! We’ll do periodic blood tests and look for lumps and bumps on your pet at each exam. In humans, allergies to pollen, mold, or dust make people sneeze. In dogs, rather than sneezing, allergies make their skin itchy. We call this skin allergy “atopy”, and large dogs often have it. The feet, belly, folds of the skin, and ears are most commonly affected. Symptoms typically start between the ages of one and three and can get worse every year. Licking the paws, rubbing the face, and frequent ear infections are the most common signs of allergies. The good news is that there are many treatment options available for these conditions. Allergies, swimming, overgrowth of hair in the ear canals, and accumulation of earwax can all predispose your dog to ear infections, which are painful and annoying. Large Breeds are very often afflicted by allergies, which can cause itching and inflammation in the ears and elsewhere. The earlier we diagnose and treat these ailments, the less discomfort and pain your pet will suffer. Be sure to call us at (920) 269-4072 if you notice him scratching or shaking his head, a foul odor from the ears, or if his ears seem painful to the touch. By monitoring for ear infections and treating them early, we also reduce the likelihood of eardrum damage that can lead to deafness. Most ear infections tend to recur until we work together to control the underlying cause. Large dogs are prone to multiple types of heart disease, which can occur both early and later in life. We’ll listen for heart murmurs and abnormal heart rhythms when we examine your pet. When indicated, we’ll perform an annual heart health check, which may include X-rays, an ECG, or an echocardiogram, depending on your dog’s risk factors. Early detection of heart disease often allows us to treat with medication that can prolong your pet’s life for many years. 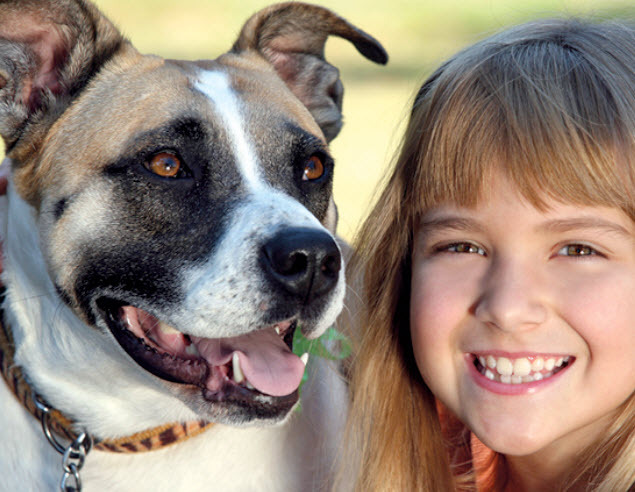 Veterinary dental care and weight control also go a long way in preventing heart disease. You’ve probably heard of hip dysplasia, an inherited disease that causes the hip joints to form improperly and leads to arthritis. Hip dysplasia is common in Large Breeds. You may notice that your pet has lameness in his hind legs or has difficulty getting up from lying down. We’ll take X-rays of your dog’s joints to identify the disease as early as possible, and we can treat the arthritis—the sooner the better—to avoid discomfort and pain. Surgery is sometimes considered in severe and life-limiting cases of hip dysplasia. And keep in mind that overweight dogs may develop arthritis years earlier than those of normal weight, causing undue pain and suffering. The cranial cruciate ligament is one of four tough bands of tissue that hold each knee together. 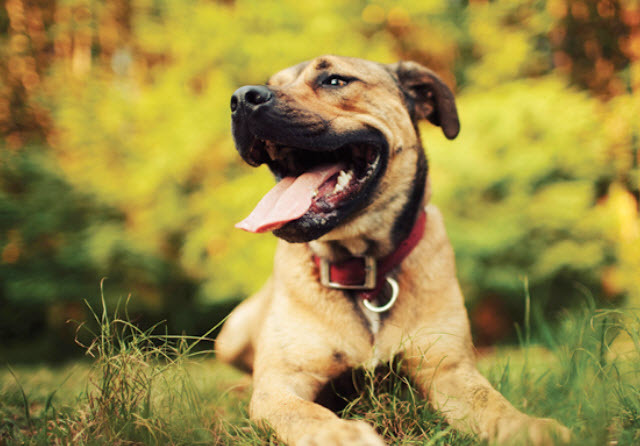 A torn cranial cruciate ligament is a common injury in active dogs, including your Large Breed. Usually, surgical correction can stabilize the knee and help prevent crippling arthritis. Physical therapy and multimodal pain management are necessary for the best outcomes. Keeping him at the right weight, feeding a high-quality diet, and avoiding too much twisting of the knees (like when playing Frisbee) are key in avoiding these painful injuries. Osteochondrosis, or OCD, is a disease of cartilage formation that results in weakened cartilage. Because cartilage is the contact layer between bones forming a joint, joint pain, lameness, and progressive arthritis result when the cartilage is damaged. A form of the disease called osteochondritis dissecans (OCD) occurs when a weakened layer of cartilage forms a flap that becomes elevated because of joint fluid dissecting between it and the surrounding cartilage and bone. Mineralization can occur when the flap breaks off and floats around in the joint. This complication, called a joint mouse, can result in a “pebble-in-the-shoe” feeling of irritation for the dog, as well as intermittent or persistent lameness. 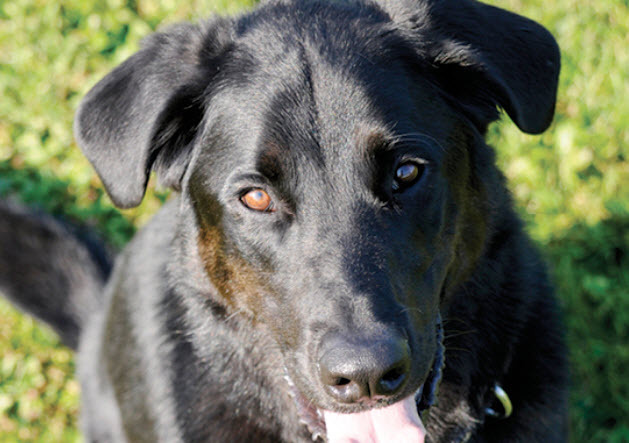 Growing large breed dogs can suffer from a painful inflammation of the long bones in the legs called eosinophilic panosteitis, or pano or eo-pan for short. It usually starts around six to ten months of age and shifts from leg to leg. Well look for this condition upon examination; if your pal exhibits pain when the area is squeezed or palpated, we’ll take X-rays to diagnose the problem. Panosteitis usually causes no permanent damage, but requires pain medication. If your dog has this condition and develops an abnormal gait to compensate for the sore leg(s), rehabilitation exercises may be required. Older dogs may develop this disease, in which the vocal cords become paralyzed and hang down into the airway. Watch for noisy breathing, especially when exercising or in hot, humid weather. In severe cases a pet can collapse and have difficulty breathing. Mild cases can be managed with changes at home and possibly medication. Bring him in right away if you notice signs because you don’t want this problem to become a surgical emergency! Large mixed-breed dogs are prone to a common condition called hypothyroidism in which the body doesn’t make enough thyroid hormone. Signs can include dry skin and coat, hair loss, susceptibility to other skin diseases, weight gain, fearfulness, aggression, or other behavioral changes. We’ll conduct a blood screening test annually to screen for the disease. Treatment is usually simple: replacement hormones given in the form of a pill. Much of what you can do to keep your dog happy and healthy is common sense, just like it is for people. Watch his diet, make sure he gets plenty of exercise, regularly brush his teeth, and call us or a pet emergency hospital when something seems unusual (see “What to Watch For” below). Be sure to adhere to the schedule of examinations and vaccinations that we recommend for him. This is when we’ll give him the necessary “check-ups” and test for diseases and conditions that are common in large mixed-breed dogs. Another very important step in caring for your pet is signing up for pet health insurance. There will certainly be medical tests and procedures he will need throughout his life, and pet health insurance will help you cover those costs. Brush her teeth at least three times a week, and don’t let her chew on bones, ice cubes, hooves, or tennis balls. If your dog has floppy, hairy ears, clean her ears weekly, even as a puppy. Don’t worry—we’ll show you how! Keep your dog’s diet consistent, feed a high-quality diet appropriate for his age, and don’t give him people food!